because all the action is happening over on our MySpace! Do you have a ‘Space? 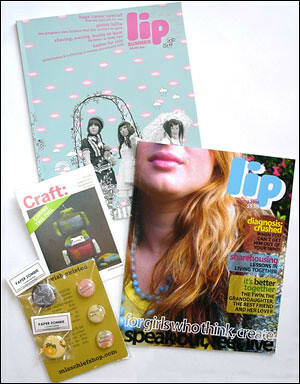 If so, add us to your friends – if you’re our 1000th friend, you’ll win our Summer Reading lip pack, including two copies of lip, a CRAFT: mini-mag and a cute button set. Yay! We now have 1000 Myspace friends: #1000 is Kimberley and Jessie of Your Wardrobe. Congratulations – you have won our summer reading pack. This entry was posted in Uncategorised and tagged competitions, myspace. Bookmark the permalink.